This world-famous scenic drive is a 31-mile bypass on US 101, in Northern California. For more information, see our page Getting to the Avenue of the Giants. The Avenue of the Giants is surrounded by Humboldt Redwoods State Park which has the largest remaining stand of old growth redwoods in the world. It is by far the most incredible display of these giant trees in the 500 mile redwood belt, and it is easily accessible from Highway 101. Slow down to enjoy the scenic drive through these amazing trees. Better yet, stop to enjoy hiking trails, picnicking, camping, fishing, restaurants, lodging, shops and galleries along the way. Take time to picnic, camp, hike, swim, fish, raft or bike ride in the cool hush of the redwood forest. Before your visit, take a few minutes to Learn About the Redwoods. If you plan on hiking, print out our informative guide to Things to Look For in the Redwoods. Along the Avenue of the Giants, eight Auto Tour signs designate interpretive panels and interesting places to stop. 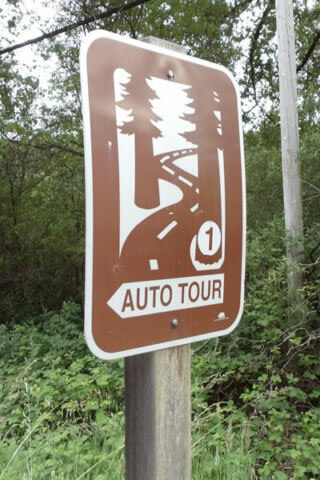 Look for the Auto Tour sign to indicate where to stop. Stops are generally about 200 feet beyond the Auto Tour signs. From the south end of the Avenue (freeway exit 645) the first stop is 1.5 miles, and it’s Stop #1: Franklin K Lane Grove. From the north end of the Avenue (freeway exit 674) the first Auto Tour stop is 2.4 miles, and it’s Stop #8: Drury-Chaney Grove. Join us in supporting the Save the Redwoods League, which has been defending the redwoods since 1918. The League protects redwoods by purchasing redwood forests and the surrounding lands needed to nurture them.